United Way’s Drop & Go Valet Tax Service is at your service – and it’s FREE! 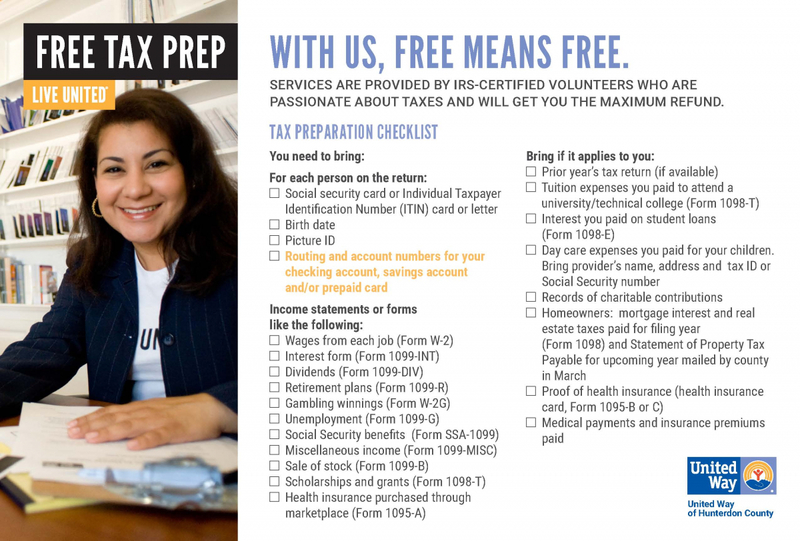 Ø All you have to do is drop off (or have someone drop off) your tax documents at a United Way Tax Preparation Site in Clinton or Flemington. Ø Your tax returns will be completed and quality reviewed within 7 days of document drop off. Once they are finished you retrieve, review and submit your return. Rapid e-filing is available too. Call: 908-237-1689 and ask for your Tax Preparation package today! Or click here to schedule an appointment with a tax preparer now. This IRS-certified service is available thanks to a unique partnership of United Way of Hunterdon County and the IRS. Join over 1,000 people who had their taxes done for free and received $1.6 million in refunds and credits! Please bring the necessary materials below and let us take care of your taxes while you go get something else done! Here is the list of tax preperation locations in Hunterdon County.